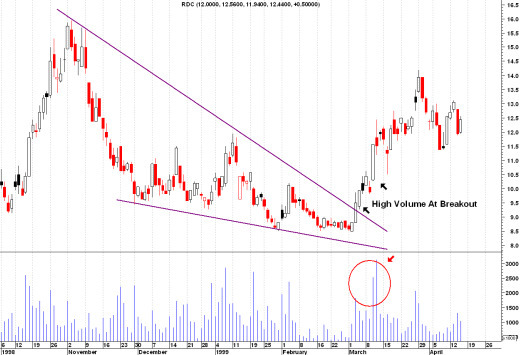 The falling wedge is a bullish stock pattern that begins wide at the top and contracts as prices move lower. This pattern can also fit into the continuation category. As a continuation pattern, the falling-wedge will still slope down, but the slope will be against the prevailing uptrend. As a reversal pattern, the falling-wedge slopes down and with the prevailing trend. Regardless of the type (reversal or continuation), falling-wedges are regarded as bullish patterns. Prior Trend: To qualify as a reversal pattern, there must be a prior trend to reverse. Ideally, the falling wedge will form after an extended downtrend and mark the final low. The pattern usually forms over a 3-6 month period and the preceding downtrend should be at least 3 months old. Upper Resistance Line: It takes at least two reaction highs to form the upper resistance line, ideally three. Each reaction high should be lower than the previous highs. Lower Support Line: At least two reaction lows are required to form the lower support line. Each reaction low should be lower than the previous lows. Contraction: The upper resistance line and lower support line converge to form a cone as the pattern matures. Shallower lows indicate a decrease in selling pressure and create a lower support line with less negative slope than the upper resistance line. Resistance Break: Bullish confirmation of the pattern does not come until the resistance line is broken with higher volume. The falling-wedge can be one of the most difficult chart patterns to accurately recognize and trade. As with most patterns, it is important to wait for a stock breakout and combine other aspects of technical analysis to confirm signals. Return from "Falling-Wedge" to the Home Page: "Stock Market For Beginners"